His Excellency Bishop Mar Jacob Angadiath, Rev. Fr. George Madathiparampil, Vicar General and Rev. Roy Joseph Kaduppil, Chancellor from Chicago Syro Malabar Cathedral appreciated the work of Indian Development Foundation in leprosy eradication programme. Dr.A.R.K.Pillai, Dr. Franklin, Dr. Narayan, Mr. Cecil Joseph and Mr. Rajan Kallumkal called on the Rev. Bishop and Rev. Fathers and explained the work of IDF. Rev. Fr. Antony Thundathil, Vicar of Syro Malabar Cathedral receiving IDF vision and mission statement from IDF team. 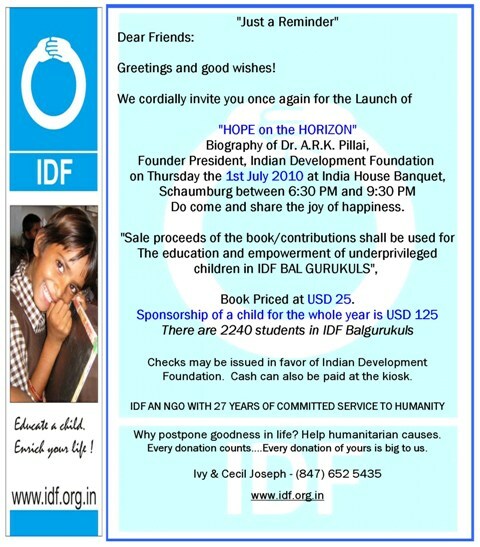 on 1st July 2010 at India House Banquet, Schaumburg, Chicago at 6:30 PM. The book is authored by Padmashri Dr. H. Sudarshan (eminent Social Reformer) and foreworded by Padmabhushan Dr. M.S. Swaminathan (father of the Green Revolution of India). Mr. George Poovathur, Mr. Mathew and Mr. Thomas from American Carpets appreciated the work of Indian Development Foundation. Chicago Mar Thoma Church invited Dr. A.R.K. 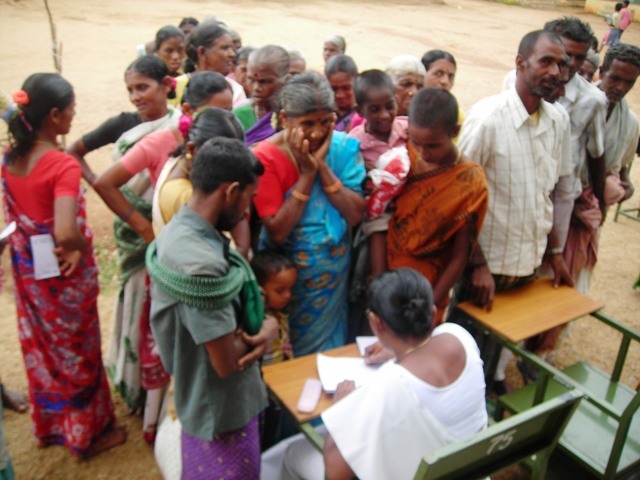 Pillai and his team to address its members on the humanitarian services undertaken by Indian Development Foundation in India for the past 27 years. Introducing Dr. Pillai Rev. Roy Thomas the Vicar of the Church, said the life-long services of Dr. Pillai is unparallel in India contemporary society and stressed on the need to take it a broader and wider range. Dr.A.R.K.Pillai addressed the members and gave an outline of the Foundation's activities in India. Rev. Fr. Roy Thomas and Rev. Fr. V. T. John appreciated the good work of IDF in servicing the society. Dr. Franklin, Dr. Narayan and Mr. Cecil Joseph also expressed their sincere thanks to Chicago Mar Thoma Church for extending all support in organising a talk for the members. Mangalorean Konkan Christian Association in USA appreciating the selfless service of Dr.A.R.K.Pillai to poor leprosy/ TB patients, presented `Humanitarian of the Year Award' at their annual gathering. Mrs. Queenie Mendonca, President of MKCA was deeply impressed by the humanitarian work of Dr.Pillai in India and thought it fit to present this prestigious award to him during his visit to Chicago. Mr. Anil Pillai and members from Geetha Mandalam in Chicago invited Dr.A.R.K.Pillai and his team from IDF to address a gathering of the members from Geetha Mandalam and later felicitated Dr.Pillai for his relentless service to the society. Dr. Pillai apprised the members on the various social programmes carried out by the Foundation for the uplift of the poor and the needy. The members appreciated the noble work of IDF. India Development Coalition of America (IDCA) appreciated the work of Indian Development Foundation (IDF) and congratulated Dr.Pillai and his team for the social responsibility efforts carried out in India. Dr. Pillai speaking to social entrepreneurs at IDCA meet in Chicago on 26th June 2010. 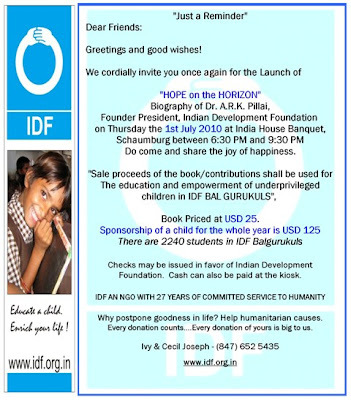 Indian Development Foundation was formally introduced to the international community at Chicago in function organized at Super 8 – O’ Hare – Elk Grove Village in Chicago on 25th June '10. A good number of Indo-Americans from Chicago had gathered to extend a warm welcome to the IDF team consisting of Dr. ARK Pillai, Dr. Narayan B. Iyer and Dr. S. Franklin. Speaking on the occasion, Dr. A.R.K. Pillai, the founder President of IDF narrated the success story of the Foundation in leprosy elimination. 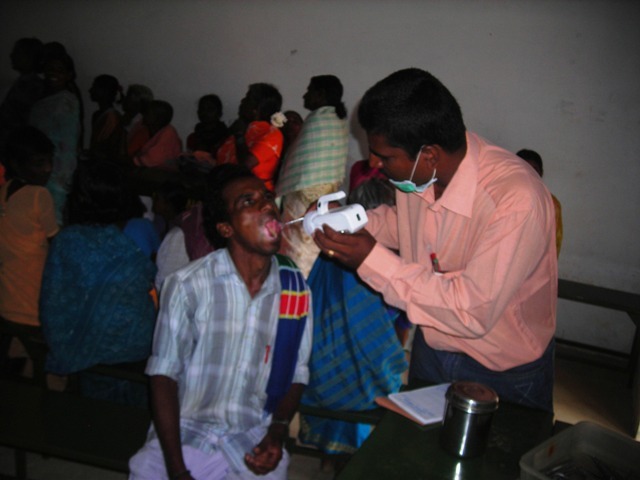 He asserted that appropriated strategies to enlist the participation of common man paid rich dividends in achieving the goal of leprosy elimination within a desirable time limit. 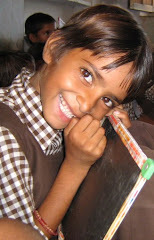 Though India had grown significantly over the decades, he lamented that there was much lacuna between the projected goals and the progress made, especially in the fields of health education and development. 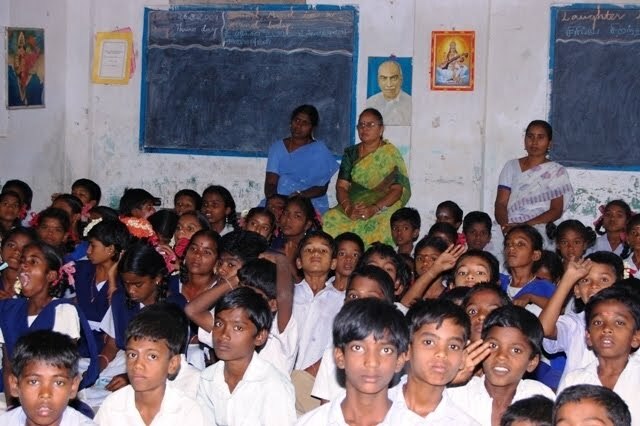 Dr. Narayan, the CEO of IDF conveyed IDF’s resolve to start one hundred Bal Gurukuls by 2020 so as to cater to the educational needs of poor and underprivileged children. Dr. Franklin cited a few examples on how IDF could effectively network with government and other NGOs towards achieving significant results. Mrs. Ivy Joseph was inducted as IDF Woman Social Ambassador during the event. 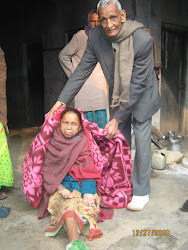 Mr. Kanti Patel and Rev. Fr.V.T. John from Mar Thoma Syrian Church spoke on the occasion and assuring the participation and support of Indians in America to IDF. Mrs. Queenie Mendonca from Mangalorean.com also appreciated the good work done by Dr. Pillai and his team. Mr. Cecil Joseph said that he was aware of the good work carried out by IDF for over two decades and expressed his resolve to help IDF to reach to a higher level. Mr. John Trivedi, Director of Operations, Chicago/ O’Hare Hotels made all arrangements for the event in a excellent manner. Dr. S. Franklin, Manager-SR, IDF and Mr. Samuel Vincent, Zonal Officer, IDF presenting a copy of "Hope on the Horizon" to Mrs. Lata Latwal, Principal, Parachute Regiment School in Bangalore. Parachute Regiment School supports IDF's humanitarian programmes. Leading NGOs including Indian Development Foundation, World Vision India and Karnataka State TB Association joined hands with Bruhat Bangalore Mahanagara Palike to sensitize Private Medical Practitioners and Family Physicians on RNTCP and the problem of TB in our country. Around 50 Private Medical practitioners/Family Physicians participated in the program organized at Dasappa Hospital Premises, BBMP Auditorium, Bangalore on the 20th of June and welcomed worthy initiative. Mr. P Dhanraj, Councilor, Sri Dharmaraya Swamy Temple Ward, lighted the traditional lamp and inaugurated the program. Dr. Shashidhar Buggi, Director & Hon Secretary SDSTRC & KSTBA and Dr. Bhaktavatsalam, Deputy Director, State TB Office, Karnataka felicitated. Dr. H R Ravindra Reddy, WHO State Consultant – RNTCP, spoke on Current Diagnostic & Treatment Practices under RNTCP. 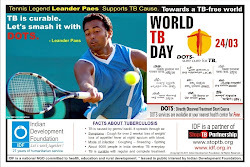 Dr. Preetish, CMO- National TB Institute, Bangalore, spoke on International Standards for T B care. Dr. Subramanyam, Ex- President, Family Physicians Association, speaking on the Role of Private Practitioners in the control of TB sought the active participation of Private Practitioners in RNTCP towards controlling TB. Dr. Jagadeesh Medical Officer, RNTCP, BBMP and Dr. Vijay Kumar S Biradar, Project Coordinator (TB), BBMP spoke on “Role of NGOs & Public Participation in RNTCP. 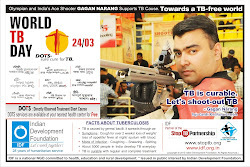 A film show on TB awareness was also organized during the program. Mr. Samuel Vincent, Zonal Officer, IDF proposed vote of thanks. Mr. Sreenath and Dr. M Somashekar from BBMP also spoke on the occasion. 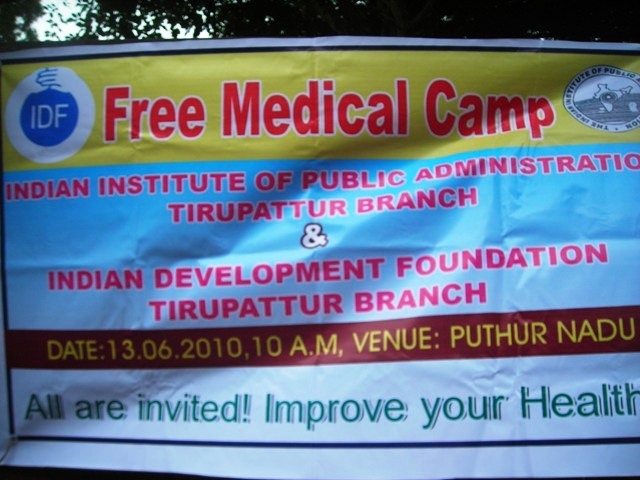 Indian Development Foundation in collaboration with Indian Institute of Public Administration (IIPA) – Tirupattur Branch organized a free medical camp at Puthur Nadu village, Vellore Dist, Tamil Nadu, on Sunday,13thJune 2010. 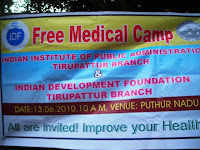 The camp was inaugurated by Dr. A. Varadarajan, Joint Director of Family Health and Rural Welfare, Govt. of Tamil Nadu, Vellore Dist. Rtn. K.M. 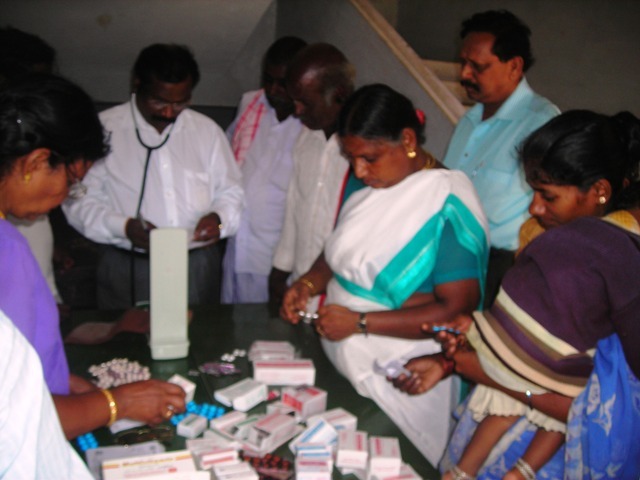 Subramaniyan, Chairman and Mr. C. Veerabadran, Treasurer, IIPA Tirupattur branch appreciated the villagers’ response to medical camp. The medical team - Dr. C. Dhandapani, Dr. Deepalakshmi , Dr. Vidhya Bharathi, Dr. R. Senthil Kumaran and Dr. Suresh - rendered excellent service during the camp. IDF wishes to thank the paramedical workers and volunteers who gave their excellent service. 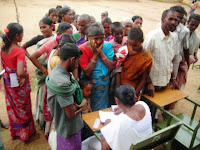 A total of 1327 persons including men, women and children from Puthur Nadu village got benefited from the medical camp. Mr. R. Settu, Co-ordinator (TN & Pondy), IDF managed the public event in a successful manner. Mr. A.K.Thiyaga Arasu, Asst. Manager at Bosch Ltd., Bangalore and an ardent supporter of IDF's leprosy/ education programmes for over a decade visited IDF Bangalore office along with his son, Rohit and handed over his personal color monitor for the benefit of IDF Bal Gurukul. Dr. S. Franklin, Manager-SR, IDF expressed sincere thanks and gratitude to Mr.Thiyaga Arasu for this noble gesture. IDF Southern Region team geared up for creating more impact in the society by giving their best during 2010-11. IDF has organised Southern Regional Development Executives Meeting at Vishranthi Nilaya in Bangalore from 1st to 3rd June 2010.